This autumn will see Moscow Ski&Board Salon take place in the Gostiny Dvor exhibition complex for the 25th time around. Many things have changed over this time but the most important thing is the fact that skiing in Russia has grown from an amateur club into a huge industry which requires professional approach. Today, Russia’s mountain resorts boast the most advanced cable cars, ropeways, and world-class hotels. The very notion of a skiing vacation changed from something that only the rich people could afford into a kind of mass tourism. For many people, a skiing vacation has become something as habitual as a summer beach vacation. The Russian skiers have already got a considerable experience of going to Europe’s best mountain resorts, and they can now make an intelligent choice based on finding the best price/quality ratio. Numerous sports stores offer all kinds of skiwear, skis, and snowboards in every conceivable price range; one can also rent everything that is necessary for skiing or snowboarding directly at the mountain resort. For years, the organizers of Moscow Ski&Board Salon have tried to turn the fair into an exciting holiday that hailed the opening of the new skiing season oriented chiefly on the direct customer, while the exhibitors – travel companies, mountain resorts, and retail stores – demonstrated their new offers meant chiefly for the end consumer. In recent years it became clear that the orientation for the direct customer, i.e. the B2C format, was growing less and less relevant. On the other hand, many of the players of the skiing market have been organizing rather expensive B2B events meant for their business partners outside of Moscow Ski&Board Salon. By this, we mean, for example, the workshops organized by national tourist offices of Alpine countries for travel companies and travel agents. In the area of sports retail, the distributors invest their funds into organizing sales meetings. We should mention that, although organized by different companies, these events are aimed at one and the same circle of industry specialists who have to come all the way up to Moscow several times a year in order to have a direct contact with products manufacturers and service providers. We do very well realize that sports goods retail and skiing tourism hinge on some certain seasonal time frames, and the season of activity at the professional market comes before the season of activity of the end consumers. That being said, the organizers of Moscow Ski&Board Salon have made a decision to shift the focus of the show from the end consumers to the industry specialists. For this reason, Moscow Ski&Board Salon, first of all, is changing its dates – the next show will take place September 13-15, 2018. The venue – Moscow’s Gostiny Dvor – remains the same. It is around these dates that the travel market organizes numerous workshops dedicated to the upcoming winter season, while most of the sports goods distributors organize various sales meetings. Many travel agents will find it convenient coming to Moscow Ski&Board Salon and getting exposed to the complete range of offers from resorts, hotels, and travel companies from many countries but, above all, from the Russian mountain resorts. The Russian retailers of winter sports goods will be able to place their orders on all the desired brands on one spot at a single time. The exhibitors should not be wary of strong competition because each of the resorts is uniquely attractive in its own way, and each brand will find its buyer. Furthermore, finding themselves at one and the same venue, the exhibiting companies will easily see their omissions and will be able to quickly enhance their competitiveness. The organizers of Moscow Ski&Board Salon guarantee comfortable working conditions and free-of-charge time in the conference halls for the exhibitors. The organizers will also give all the visitors and exhibitors an opportunity for pre-scheduling their meetings with partners and inviting the important people to their presentations well in advance. Getting together, the exhibitors will create comfortable working conditions for the professional visitors who in turn will be able to save their time and money on getting the required business information, while the exhibitors themselves will save up on organizing their presentations and will get a better visitor turnout as compared to individual figures (workshop and sales meetings organized outside of Moscow Ski&Board Salon). The simultaneous organization of several events of different (yet still related) subjects will allow the exhibitors and visitors of Moscow Ski&Board Salon to get contacts in mixed areas of activity, which will possibly lead to finding opportunities for expanding their business. The forum is devoted to the development of the domestic mountain recreational areas. The forum will feature presentations by Russia’s and the world’s leading experts in design, construction, operation, marketing and sales of ski resorts and hotels. The forum will also showcase the new projects for developing mountain resorts and technological novelties of the trade. The representatives of mountain resorts will be able to share their experience, listen to the presentations by world-class specialists, make new contacts (or maintain old ones) with the manufacturers of ropeways, snow-making systems, snow groomers, spa industry, as well as make new ties with the tourist market, attract sports stores to open at their mountain resorts, as well as rental companies, investors, and other specialists. For this workshop, the organizers are inviting the representatives of all the countries that offer skiing recreation on the Russian travel market, as well as the representatives of all Russian mountain resorts and travel agents. The workshop is devoted to marketing and sales in the area of skiing tourism. The workshop is meant to be visited by the Russian travel companies that will get a great opportunity to compare the skiing and accommodation conditions, the flight pricing, transport logistics in the area of transferring the skiers to the resorts, as well as the loyalty of the mountain resorts to travel companies. The visitors will also be able to establish ties with ski schools, ski instructors and freeride guides, as well as get the latest news from the leading specialists of the skiing market. The organizers are inviting all the Russian and foreign sport brands and sports goods distributors, who will make quotation offers to the retailers on sales and rental of sports equipment. There will also be a conference on marketing in sports goods retail. New products and technologies will be presented, as well as new discount price offers will be made on stock goods as part of the “Black Friday” project. The representatives of sports brands, distributors and retailers will not only get an opportunity for organizing a successful event but will also be able to make new contacts with mountain resorts, travel agents, and ski schools in order to promote their product more effectively, launch new stores and rental points at mountain resorts, get wholesale orders, organize gear tests and other marketing events. Professional ski and snowboard instructors will discuss law-making initiative on legalizing and protecting the work of instructors and guides, and will share their experience on the teaching methods, mountain safety issues, as well as showcase their services to the mountain resorts and travel market. Organized by SportB2B Group and Sports Leaders. The forum is devoted to the effective management of sports facilities, land use and development, construction of housing complexes with regard to the sports factor, private and public investment into the construction of sports facilities, anti-crisis management of sports facilities, equipping gyms, schools, and kindergartens, making sports areas at mountain resorts and hotels. The forum will include master classes by Russia’s and the world’s leading experts, as well as the IV sports IT forum and an individual session called “Integrated safety of sports facilities”. The organizers of Moscow Ski&Board Salon are ready to pay attention to all of the exhibitors’ wishes and requirements on organizing the work of the upcoming show, and approach every case on an individual basis. 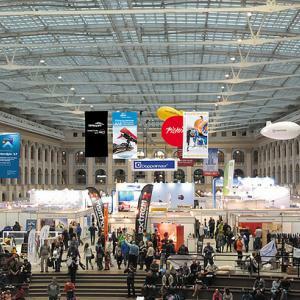 We welcome every initiative for organizing new events at Moscow Ski&Board Salon. In spite of the fact that we are going to be chiefly oriented toward the B2B format, the direct customers will of course have free access to the show.